LA JOLLA, California, March 18, 2019 (ENS) – Only 10 vaquita porpoises likely remain in the world, marine mammal scientists reveal in a new report, warning that the animal’s extinction is certain without bold, immediate action to remove gillnets from their habitat. Between 1997 and 2019, gillnets killed hundreds of vaquitas, the world’s smallest and most endangered porpoises, found only in Mexico’s northern Gulf of California. Their estimated population dropped from close to 600 in 1997 to fewer than 20 animals today, according to the International Committee for the Recovery of the Vaquita, CIRVA. The release of the new vaquita assessment comes two days after reports of the first vaquita mortality of 2019. The announcement from CIRVA calls on Mexico President Andres Manuel Lopez Obrador to end all gillnet fishing in the vaquita’s small remaining habitat and adopt a “zero tolerance” policy for enforcement of the ban. 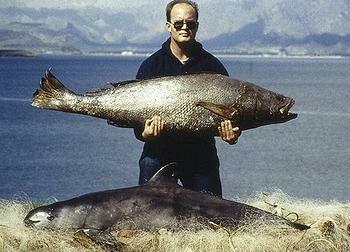 The totoaba, Totoaba macdonaldi, a marine fish, the largest member of the drum family, is found only in the Gulf of California. Once abundant and subject to an intensive fishery, the totoaba has become rare and is now listed as Critically Endangered on the IUCN’s Red List of Threatened Species. “Poachers prize totoaba for their swim bladders, which are dried and smuggled by organized crime cartels to China, where they are sold on the black market for prices that can reach US$46,000 per kilogram,” CIRVA reports. Totoaba swim bladders are highly valued for their perceived medicinal properties. The bladders are erroneously believed by many Chinese to be a treatment for fertility, circulatory, and skin problems. 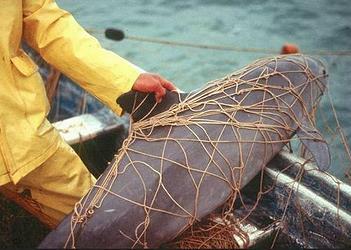 The vaquita die entangled in illegal gillnets set for shrimp and other fish species, including endangered totoaba. In 2017, in the face of international pressure, Mexico banned the use of most gillnets within the vaquita’s range, but there has been little enforcement of the ban. During the 2018 illegal totoaba fishing season, nearly 400 active totoaba gillnets were documented in a small portion of the vaquita’s range, and gillnets continue to be found within the vaquita refuge. The recent violence against conservationists in the region has limited critically important net removal efforts. Now four U.S. conservation advocacy groups have joined in a written plea to the Mexican President to get rid of the gillnets once and for all. They are: the Animal Welfare Institute, the Center for Biological Diversity, the Environmental Investigation Agency, and the Natural Resources Defense Council. “If Mexico doesn’t want to be guilty of wiping out a species, it needs to secure 100 percent gillnet-free habitat now,” said Zak Smith, senior attorney with the Marine Mammal Protection Project of the Natural Resources Defense Council. “What’s happening to the vaquita is a disgrace and entirely preventable, yet the Obrador administration has not committed to a robust vaquita recovery plan and has already missed deadlines on vaquita conservation commitments,” Smith said. Despite the marine mammal’s alarming decline, CIRVA emphasized that the vaquita is not extinct and that recovery remains possible. The vaquita are still producing offspring, and the remaining animals are healthy, showing no signs of disease or malnutrition. 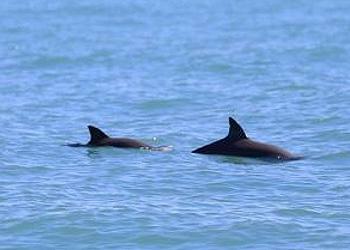 The international community plays a critical role in vaquita conservation. In 2018, a U.S. court temporarily banned the import of seafood caught with gillnets in vaquita habitat. This year, parties to the Convention on International Trade in Endangered Species, CITES, and the World Heritage Convention are considering additional conservation measures for the vaquita and totoaba.